This has become common knowledge... Long tail keywords are much easier to rank for than 1 word keywords. The level of competition is generally much lower, and they are often more targeted, meaning people are more likely to click your link in the search engine results, read your content and buy from you. That's why we decided to create a tool that allows you to find tons of long tail keywords with ease. With our 'Long Tail Keywords' tool, you can access hundreds, if not thousands of 'hidden', untapped keywords, in just a few clicks. All you need to do is to type in a keyword, select a database: Google, Bing, YouTube, Amazon, eBay That's it! 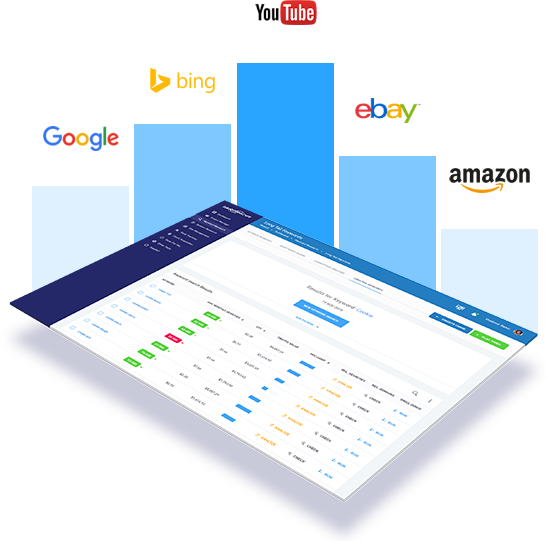 Our tool will even show you their average monthly searches, trends graphs, CPC and traffic values, PPC competition and more. We are one of the very few providers of search volumes for long tail keywords. This is a great idea generator, or simply a way to find long tail anchors to use in your SEO campaigns. 'Long Tail Keywords' also allows you to filter results, and even export them, in a text or CSV file. Did you know that over 15% of searches performed have never been typed in before? Shocking statistic, but now you can know about them first!